It maybe too early to declare Birdman as the best movie of the year. Or even suggest Michael Keaton, Emma Stone, and Edward Norton for acting awards. It's hard not to watch this film and be wowed by the stedi-cam work that never ends while the story moves with it. Or be at the edge of your seat by the percussive soundtrack that emphasizes the New York machine gun dialogue. Co-written, produced, and directed by Alejandro González Iñárritu (Babel, 21 Grams, Blutiful) and written with Nicolás Giacobone, Alexander Dinelaris, Jr. and Armando Bo. The story walks the edge of truth and fantasy. 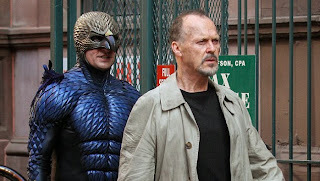 Riggan Thomson (Michael Keaton) is a washed up movie actor whose claim to fame is playing a super hero, Birdman. Much like Michael Keaton's own movie history playing Batman. Thomson has thrown all his eggs in the basket hoping for an artistic comeback by adapting Raymond Carver's short story We Talk About When We Talk About Love for Broadway. The action centers in the dressing rooms, the hallways, the backstages and the main stage of the theater while the characters weave in and out of moments. The day before the preview performances, Ralph (Jeremy Shamos) gets knocked on the head by some stage equipment, which secretly pleases everyone because he's a horrible actor. Lesley (Naomi Watts) suggests her boyfriend Mike Shiner (Edward Norton) for the part. His name is not only a draw, but he impresses Riggan with his talent. What he doesn't know is that he's a lose cannon. It's a glitch they will have to endure because Jake (Zach Galifianakis), Riggan's best friend and lawyer, says ticket sales are up due to his casting. On top of this Riggan's girlfriend Laura (Andrea Riseborough) thinks she is pregnant. Sylvia (Amy Ryan), Riggan's ex wife shows up to take their daughter Sam (Emma Stone) to lunch. Sam is working as her dad's personal assistant having just come out of rehab. She's got an attitude against her father who she felt was never around. On top of it all, Riggan is hearing the voice of his Birdman persona that berating and advising him. Cinematographer Emmanuel Lubezki won an Oscar for Gravity and this should also be another winner for the year. The roving camera makes it feel like we are following characters in real time, then walking down the hall entering the stage where they are rehearsing, then a change of angle shows the audience of the live performance. The camera moves constantly like one continuous shot. It's a conceit but brilliantly realized. The story within a story within another story is held together by the concept of understanding love. Everyone trying to find their place in life, acceptance and accomplishment. Everyone is battling something or someone. All exacerbated by the flaming ego of actors. Even Mike says that he's only real on stage. This tightrope of success can be tipped either way by the word of a critic, Tabitha (Lindsay Duncan) who swears she will close his show without even seeing the play because she doesn't like celebrities tainting the holy ground of Broadway. There are some uneven moments of the film, but it's definitely up there with the must see of the year.